New tractors, sprayers and Gator utility vehicles, plus a new round baler and mower-conditioner, will be featured for the first time on the John Deere stand at LAMMA 2014. Several of the machines are making their UK farming show debut, following their European launch last summer. Representing 10 different product ranges, including six tractor series, these latest models have been designed to improve machine performance, uptime and operating costs for both arable and livestock farmers, as well as contractors. New tractor ranges on display are the 4M, 5E, 5M, 6MC, 7R and 8R Series, including the latter’s range topping 370hp 8370R wheeled and 8370RT tracked models. All feature Stage IIIB compliant diesel-only engines. Two 100hp tractors on show include the 6100MC, which has a more compact design than its 6M Series equivalent and is available with an optional low-profile cab for access to small buildings. Its durable full frame is specifically designed to accept John Deere H Series front loaders. The 5100M tractor is also available with a standard or low-profile cab and matching front loaders. In addition, the 5M Series includes open operator station and narrow versions, and offers a wide choice of transmission options. The needs of smaller-scale farmers, including speciality crop producers and part-time farmers or smallholders, are also catered for by the 4M and 5E Series three- and four-cylinder tractors from 49 to 95hp, represented at LAMMA by the 4049M, equipped with an H170 front loader, and 5075E models. The new M732i and M962i trailed sprayers are equipped with 3200- and 6200-litre tank capacities, and can carry double or triple folding booms up to 30 or 40m, respectively. Both these models are ISOBUS ready, so the machines can communicate with the tractor and enable a range of ‘intelligent’ John Deere solutions. These include a Tank Fill Calculator, which helps the operator to calculate the correct amount of refill volumes required for each application, BoomTrac automatic boom height and tilt control and FieldDoc documentation software. AutoTrac automatic steering and boom Sectional Control are also available. A new Implement Display 1100 has been developed to control the sprayer in conjunction with the multi-function lever. The M962i also offers an in-cab nozzle control, allowing the operator to switch between different types of spray nozzle on the move. John Deere’s new heavy-duty Gator utility vehicle line-up features two new four-wheel drive models for 2014, the fast and powerful XUV 825i petrol model in green and yellow livery and the four-passenger XUV 855D S4 diesel version in olive and black. Top speeds are 44 and 32mph respectively, and both have the same cargo box, towing and payload capacities of 454, 680 and 635kg. The vehicles can be ordered with a variety of factory and dealer installed options and attachments for extra versatility. 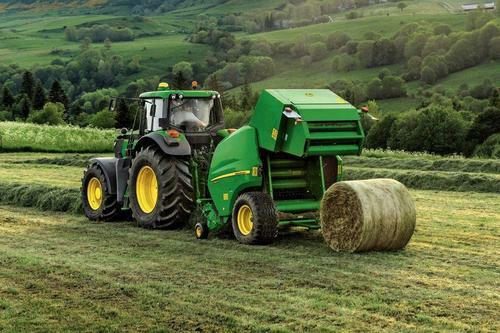 The F440R fixed chamber round baler is primarily aimed at customers who produce more than 3000 silage bales per season. This new model utilises a number of components from the premium 900 Series, for faster baling in heavy grass windrows without plugging. These include a high capacity 2m or optional 2.2m pick-up and a MaxiCut rotor with 13 or 25 knives. Finally, the new 830 centre-pivot mower conditioner has a working width of 3m, with a choice of conditioning impellers or rollers. It features a reinforced frame, large tyres, improved disc protection and a redesigned transmission for increased reliability and performance, while the newly designed floating suspension system allows the machine to closely follow ground contours. As an exclusive feature, the modular cutterbar has been engineered to duplicate the load conditions of a self-propelled machine and allow high-speed mowing. The conditioner is also equipped with preloaded tines, which significantly increase capacity and the crop flow under varying harvesting conditions. These new products will be shown alongside a wide range of other John Deere tractors, sprayers, combines, hay and forage equipment, Gators and AMS GreenStar and FarmSight precision farming systems.